Built To Last: 100+ Year-Old Hotels in New York (2011), by Stanley Turkel, describes the hotel at 1295 Madison Avenue as follows, "In 1902, the 92-room Hotel Chastaignery opened on 92nd Street and Madison Avenue in a neighborhood call Carnegie Hill. After four name changes over one hundred years, it became the Wales Hotel and in 2000, was wonderfully well-restored. Its various names after Chastaignery were Hotel Bibo, Hotel Bon Ray, the Carnegie Hill Hotel and the Wales. ..."
Also, the year the Chastaigneray opened would appear to be 1901, not 1902. It was listed in both Trow's New York City Directory and in a New York telephone directory in 1901. In addition, Turkel spells the original name "Chastaignery" instead of the "Chastaigneray" that appears in advertising and elsewhere. The original proprietor of the Hotel Chastaigneray was Charles Jaimes (1855-?). Jaimes was also hotel keeper at the Brevoort, 5th Avenue and 8th St. This ad from the Brooklyn Daily Eagle, October 1901, shows Jaimes as proprietor of both hotels. A description of the Chastaigneray also appeared in the Brooklyn Daily Eagle, 22 Oct. 1901, pg. 12, beginning, "The Hotel Chastaigneray, at Madison avenue and Ninety-second street, Manhattan, which was recently opened under the proprietorship of Charles Jaimes, has already earned a well recognized place among the many first class hotels of the city" (click for full article). In 1903 the New York Times, 4 Dec. 1903, pg. 12, reported, "Charles Jaimes - Judge Holt of the United States District Court has refused to grant a discharge in bankruptcy to Charles Jaimes, formerly proprietor of the Brevoort House and the Hotel Chastaigneray, Ninety-second Street and Madison Avenue, and confirmed the report of Morris S. Wise, referee in bankruptcy, who sustained the objection of two creditors, that he failed to keep proper books of account and concealed property from the trustee. A petition in bankruptcy was filed against Mr. Jaimes on Jan. 7, 1902, and his schedules showed liabilities of $85,510 and assets of $34,474." Another early owner / operator of the Hotel Chastaigneray was a real estate man, Ernest Tribelhorn (1872-1954). The Real Estate Record and Builders' Guide, 22 Feb. 1902, pg. 342, noted, "Amongst the heavy business since the first of the year, comes the arrangement from Ernest Tribelhorn that he has taken under management and lease, a large number of buildings, chief of which are: ... 'Hotel Chastaigneray,' northeast corner of Madison av and 92d st..." Also in 1902 the New York Times, 16 Aug. 1902, pg. 12, reported, "Ernest Tribelhorn has bought the four-story dwelling 45 East Ninety-second Street. 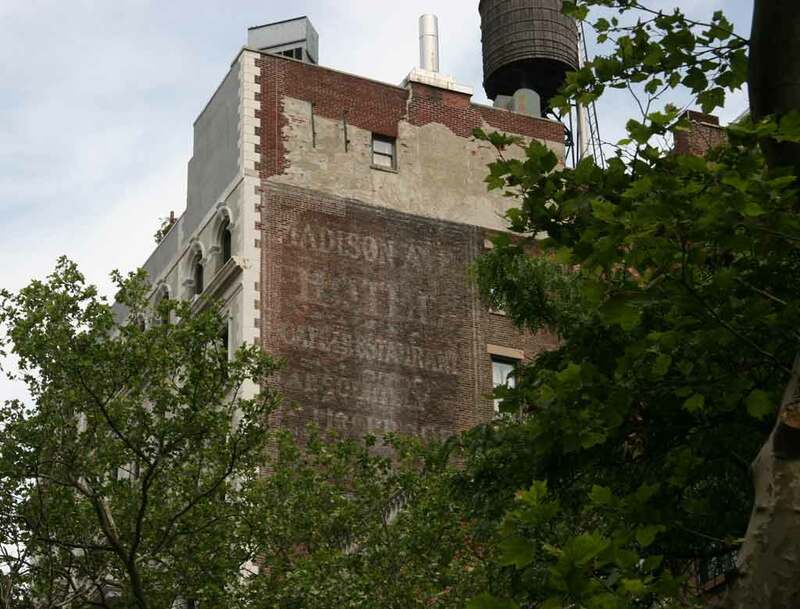 This house adjoins the Carnegie Hill Hotel at the northeast corner of Madison Avenue and Ninety-second Street, and will probably be operated as an annex to that structure." Tribelhorn's obituary, New York Times, 11 July 1954, pg. 73, read, "Ernest Tribelhorn, owner and developer of property on Riverside Drive since the early Nineteen Twenties, died on Friday in St. Luke's Hospital, after a week's illness. His age was 81. He resided at 38 Riverside Drive. Mr. Tribelhorn owned and operated the Carnegie Hill Hotel, Madison Avenue and Ninety-second Street, in 1902. After coming to this country from Switzerland at an early age, he started in the lace business. He was a Mason and an Elk. Surviving are a daughter, Mrs. Lillian F. Stevens, and two sons, Ernest Jr. and William F. Tribelhorn." Trow's New York City Copartnership Directory for 1910 listed the Hotel Melbourne Co. at 1301 Madison Avenue, with Edwin Winthrop Boyce (1867-1954), president, and Fenwick W. Hatfield (1869?-? ), secretary. Both Boyce and Hatfield were recorded in the 1910 U. S. Census living at 1295 Madison Avenue along with a total of 51 residents at that address. Boyce is designated "Hotel Keeper" and Hatfield "Manager." At a later date Boyce is found as hotel proprietor in St. Petersburg, Florida. Fenwick Hatfield became a manager at the Hotel Marlton, 3 W. 8th St., in Greenwich Village, Manhattan. By 1914 proprietor at what was now the Bon Ray Hotel (sometimes hyphenated Bon-Ray) was Morris Newgold (1865-?). In the 1910 U. S. Census Morris Newgold was proprietor at the Hotel Times Square, 206 W. 43rd St. He appeared as proprietor of the Hotel Bon-Ray, 1295 Madison Ave., in the New York telephone directory in 1913. This 1913 ad for the Hotel Bon Ray "formerly Madison Avenue Hotel" cites Morris Newgold as proprietor. This 1914 ad for the Hotel Bon Ray also cites Morris Newgold as proprietor and "Also Hotel Times Square, B'way & 43rd St." In 1933 the New York Times, 22 June 1933, pg. 20, reported, "Arrested yesterday charged with having failed to satisfy employes' compensation claims totaling $117, Morris Newgold, proprietor of the Hotel Wales at 1,295 Madison Avenue, was arraigned in night court and held in $500 bail for a hearing in the Ulster County Court next Monday. The claims were for injuries received by workmen engaged in building a hotel for Newgold at Kingston, N. Y. Newgold posted the bail." A later owner was Edward Charles Bibo (1870-1929), for whom the hotel was renamed the Bibo in the period 1919 to 1925. In 1920 The Pottery, Glass & Brass Salesman, 20 May 1920, pg. 9, reported, "Edward C. Bibo, who has been United States customs appraising officer of pottery and china wares at the Port of New York since January, 1907, has resigned his position and will confine his efforts in the future to the hotel business, he having taken over the Hotel Bibo, at Ninety-second Street and Madison Avenue, New York, and also the Hollywood Lodge at Highmount, Catskill Mountains. ..." Bibo's obituary, New York Times, 2 Dec. 1929, pg. 25, read, "Edward C. Bibo of the Hotel Wales, Ninety-second Street and Madison Avenue, formerly for twenty years attached to the customs service here as an appraiser of china, died yesterday morning in Mt. Sinai Hospital of heart disease at the age of 59. He left a wife, Miriam M. Bibo, and a daughter, Carola, founder of the Junior League of the Vacation Home for Crippled Children. Funeral services will be held in Riverside Memorial Chapel, 180 West Seventy-sixth Street, at 10 A. M., tomorrow. Since his retirement from the government service Mr. Bibo had been associated with his wife in various hotel enterprises here, in Palm Beach, Fla., and at Highmount, N. Y. He owned the lease of the Hotel Wales, and last June Mrs. Bibo bought the least [sic] of the Hotel Brewster, which is on the same corner of Madison Avenue." The 1920 U. S. Census recorded 109 residents at 1295 Madison Avenue, including Edward E. Bibo, age 49, "Examiner, U. S. Customs," and his wife Miriam M. Bibo, age 45, "Manager, Hotel." The 1930 U. S. Census recorded 100 residents of the Wales Hotel at 1295 Madison Avenue. Among them was Miriam M. Bibo (1875-1964), Edward Bibo's widow. She was recorded as age 54, born New York, "proprietor, hotel." Miriam Bibo was born Miriam Hoffman July 1875 and married Edward Bibo 24 January 1896 in New York City. The 1940 U. S. Census recorded 114 residents of the Wales Hotel at 1295 Madison Avenue. In 1950 the New York Times, 25 Jan. 1950, pg. 52, reported, "In its first change of ownership in thirty-one years, the Hotel Wales, a nine-story building on plot 62 by 100 feet at the northeast corner of Madison Avenue and Ninety-second Street, has been sold by the Bon Ray Hotel Corporation to John Malacoof for investment, it was announced yesterday. There are ninety-six apartments and a penthouse in the building, which was held at $400,000 and was sold through the Raymond P. Quinn Company, broker."